Home » blog » Gaia Second Data Release Event in Barcelona. On Wednesday 25 April 2018, the European Space Agency (ESA) publish the second data release of the Gaia mission. 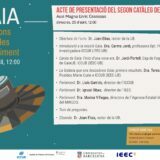 The team of researchers from the Universitat de Barcelona (ICCUB/IEEC) organises an event open to the general public in the Faculty of Physics (Av. Diagonal 647, Barcelona) where the new data will be presented and the new era in astronomy that it begins will be described. 12:00 Opening of the event by Dr. Joan Elias, Rector of the Universitat de Barcelona. 12:05 «Introducción a la misión Gaia». Dr. Carme Jordi, professor of the Quantum Physics and Astrofphysics department and member of Institut de Ciències del Cosmos and Institut d’Estudis Espacials de Catalunya. 12:10 «El archivo de Gaia: el inicio de una nueva era». Dr. Jordi Portell, head of the engineering group from the Gaia-Barcelona team. 12:25 «La Galaxia que nos descubre Gaia: primeros resultados». Dr. Teresa Antoja. Marie Curie postdoctoral researcher at Institut de Ciències del Cosmos. 12:40 Dr. Lluís Garrido, director of Institut de Ciències del Cosmos (Universitat de Barcelona). 12:45 Dr. Ignasi Ribas, director of Institut d´Estudis Espacials de Catalunya. 12:50 Dr. Marina Villegas, director of the Agencia Estatal de Investigación del Ministerio de Economia, Industria y Competitividad. 13:00 Closing by Dr. Joan Elias, rector de la Universitat de Barcelona.